The gardens have been worked on extensively for the past few months! Things are starting to bloom! The real changes are on the side…. To a charming space! Bricks (hand-made ones…that is key!!) are laid in sand…..not mortar….that is key also! This is so lovely! They added the old brick steps…..and two stone benches. The lawn was too shaded to grow or thrive; so this made a beautiful and comfortable poolside. Another view. I love it!!!! Simple and elegant! The hedge used to completely hide the pool ; now it is sheltered and private; but welcoming! Boxwood and white roses surround the lawn. Just planted!!! This is the back terrace. The eating area off the family room and kitchen. The barbecue is cleverly disguised on the right! The view from the back terrace! I will post the interior changes soon! It is a process! where Ty Warner (beanie babies) built the most enormous house in Montecito! He bought 5 houses on a bluff overlooking the ocean; tore them all down; (all of them multi-million dollar houses) and built an enormous “Venetian” Palazzo. “And I want to be there when you meet her and see what she has created in our neighborhood! You are going to have a complete fit!!! Originally, there was a Country Club on this entire bluff. Around the turn-of- the- century , these stables were to house the horses for the carriages who came to play golf and visit! The first hint of what was to come! What a mailbox! How had I possibly missed these gates!! I have been by here so many times! It is right across the street from the Music Academy of the West!! 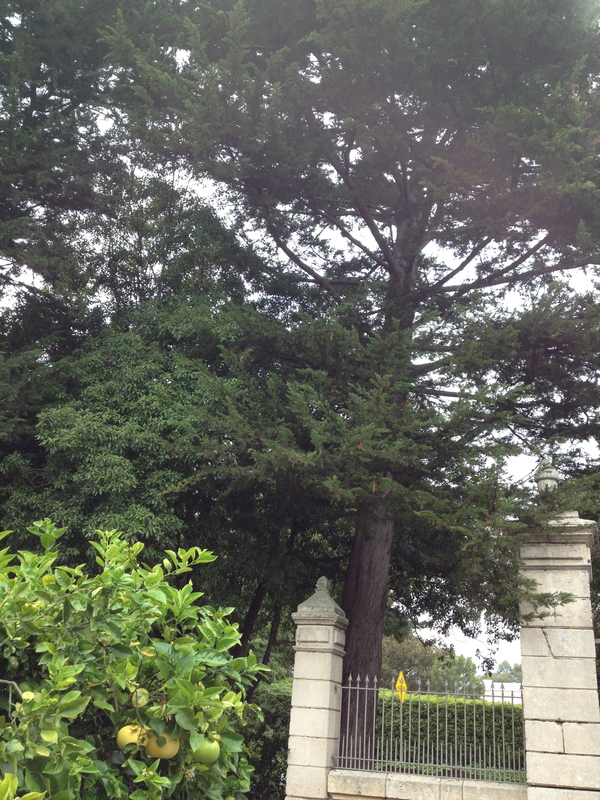 And these magnificent gates!! These are most beautiful gateposts and gates I have ever seen here! When I met Renee she said; “Oh we were in France when I started here! See those grapefruits? There was an orchard here that had also been part of the Club. Lovely nasturtiums sprouting out and about ! This little “moment” just inside the gates! Following the wide path to where???? When I saw these rusty arched french doors with the beautiful roses climbing on them; I had an even better idea of what was coming. However, nothing could have prepared me for what was to come !! I wish I had Steve Giannetti with me. I’m just not a great photographer; but I have done the best I can!! 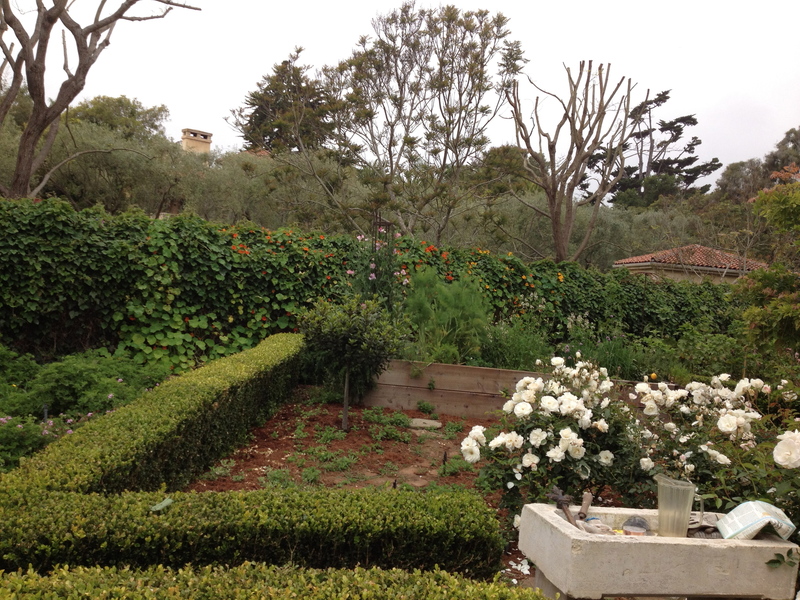 Look to the left; raised beds surrounded by boxwood! The sweet peas are climbing up a French “tree guard”! 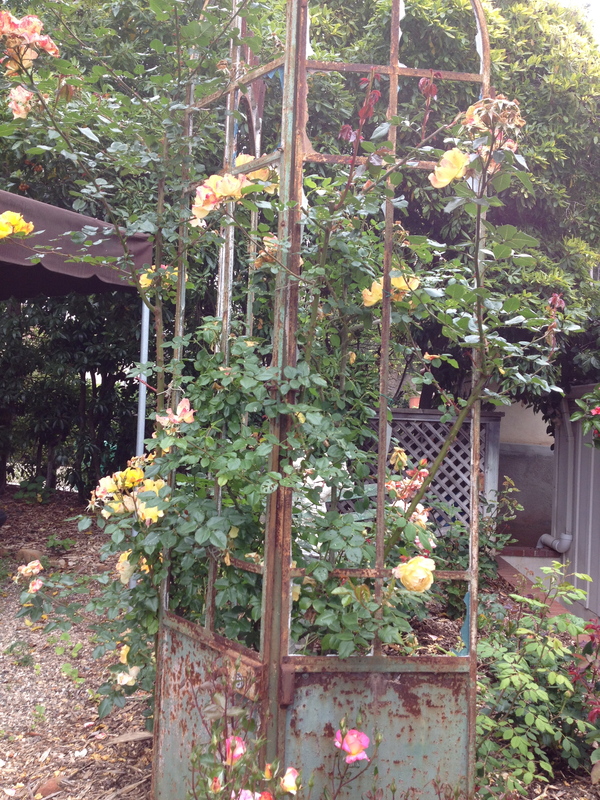 Some charming fencing to help the roses climb! No house yet!!! Coming around the bend….a one story house with an astonishing trumpet vine going all the way around it!! Right next to the house, an old pergola (original ) covered with wisteria. One separate house is the bedroom and bath. One house the living, dining kitchen! The larger house was originally one room! I’m posting the interiors in my next post! A clever way to hide the meters and things! The outdoor dining terrace with the most charming barbecue I have ever seen! It was foggy; but the view from here is across a rose parterre garden belonging to the house next door; and then the ocean!! That “view corridor” is protected! 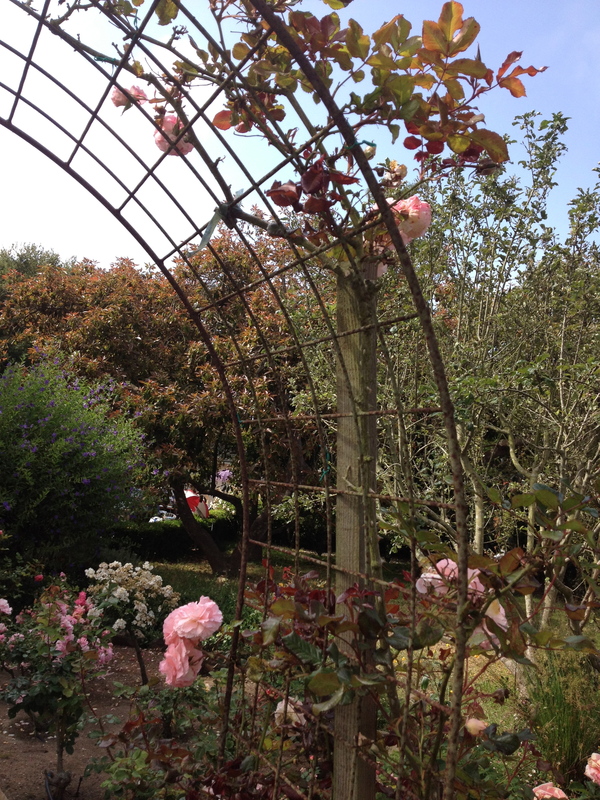 Renee raised the terrace two feet so the view was over the hedge and through the rose garden to the sea! Renee brought her stone sink from her Paris apartment to use outside! she lets the alyssum sprout where it wants! This is the path between the “living” and bedroom areas. This is between the two buildings this chandelier is here! Outside……..totally charming…..(I have to keep adding) it is just too much to do in one post! even the outside!! This is the view from her husband’s desk in a corner of the “bedroom cottage”. This is a little corner with things “in progress”! Nothing; and I mean NOTHING is “staged”! This is real……real living!! This is the chimney of the fireplace in the “living cottage”; and evidence of this trumpet vine that goes all over the entire two buildings. If someone made me pick my favorite thing in the entire place; I would pick the next picture. 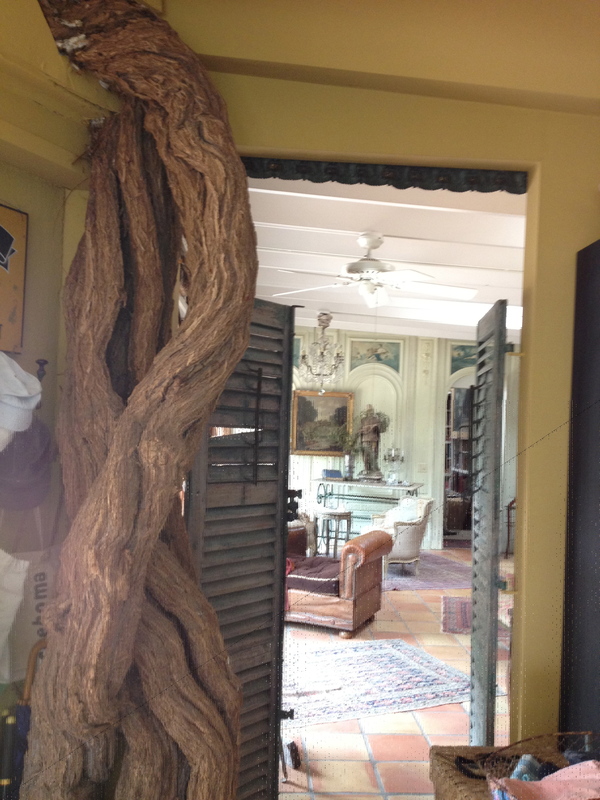 It is the trunk of the 120 year old trumpet vine INSIDE THE FRONT DOOR!!! It is a miracle beyond that it has survive intact! It had a “guardian angel” protecting it. 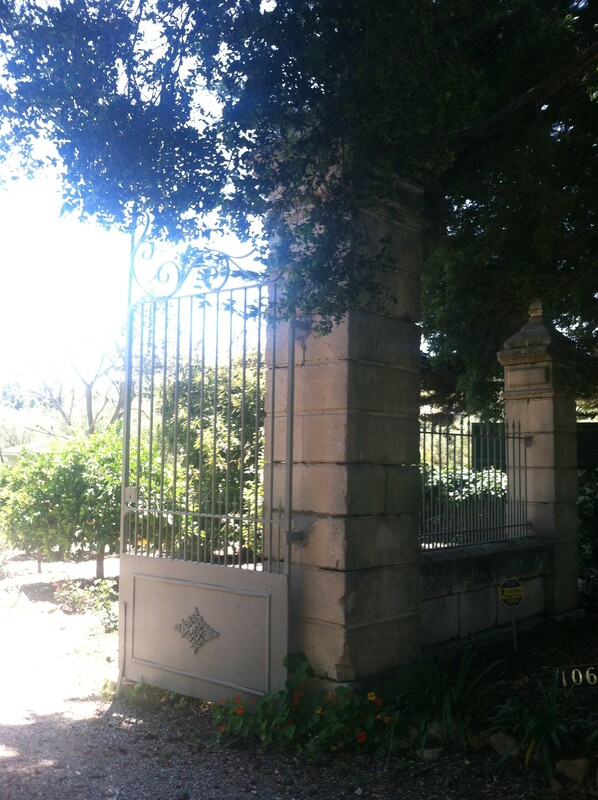 Nothing like this whole stable, the pergola…….the trumpet vine……nothing like this has survived here in Montecito……or any other enclave with wealth….and the ability to change. When she barbecues she “just moves the vines away”…and then puts them back when it’s all cooled off”! The top of the barbecue chimney is the top of a dovecote found at a “brocantes fair” in Provence! This is a glimpse of the lovely house next door which owns the rose garden! Renee just raised the floor of the pergola; now the view is over the hedge and to the rose garden. She cautioned the gardener not to trim that “leggy branch” of lavender going across the steps! Another view of the next door property. These are some of the old shutters all over the inside and outside! Renee is a “magician”, in my opinion!!! By the way, my friend Bonnie was treated by my having a complete fit the entire time! It must have been like watching a trained seal perform!! I could hardly breathe I loved it all so much! You really couldn’t take it all at once!! The real miracle is that these once “derelict” buildings and this astonishing vine survived until 12 years ago! They were awaiting rescue! How often does that happen? Not enough, if you ask me! Oh! I forgot to tell you that after I saw this house and garden with Bonnie; Bonne and Renee came over to my house and garden! She threw the same conniption fits that I did at her house; so we had a lively discussion about which one is more ingenious! It was so much fun for me to meet such an incredibly gifted and imaginative “soul mate”!! There will be more coming from this source!! !